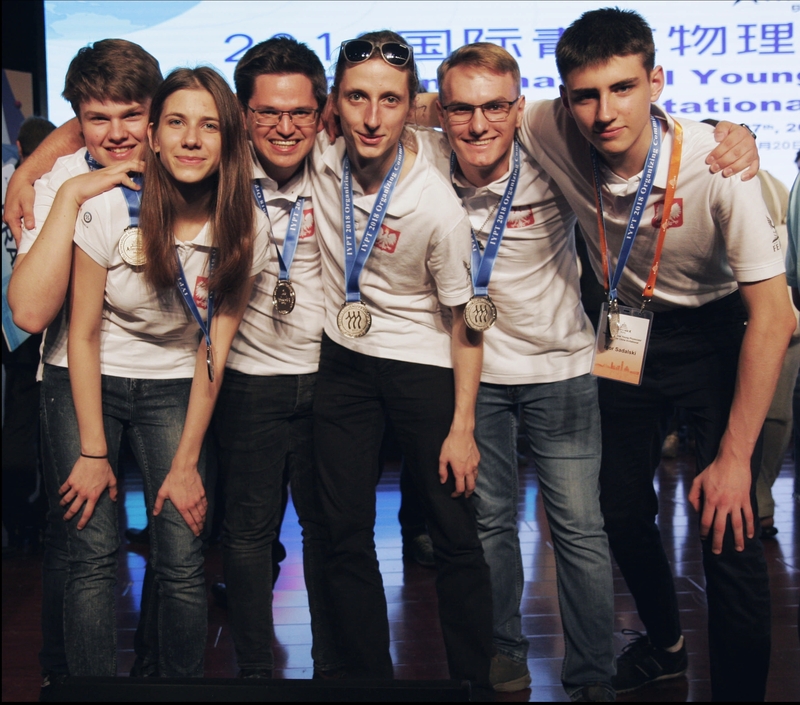 The Polish national team at the International Young Physicists' Tournament received the silver medal taking the eighth place in the general ranking. The competition took place on 19-25.07.2018 at the Renmin University in Beijing. The team included: Michał Bucoń (captain), Zofia Dziekan, Adam Gałązka and Igor Sadalski high school students and members of the Fenix Scientific Club. Łukasz Gładczuk and Radost Waszkiewicz, the previous gold medalists of the tournament and the founders of the club, helped the team in the whole year's preparations. During the competition 32 teams from around the world competed against each other. During five intense days of competition, participants they had the opportunity to present their solutions to problems and discuss them. The competition consisted of 17 research problems, the subject of which was, inter alia, to investigate the change in color with the degree of fragmentation of substances, explanation of the formation of radiant flares in the pictures of streetlights made at night or discussing the principle Tesla valve operation. The tournament was also a unique opportunity for intercultural exchange of experiences and meet other physics enthusiasts from around the world. We keep our fingers crossed for future successes. Next competition The International Tournament of Young Physicists will be held for a year at the Warsaw Polytechnic. The Institute of Physics of the Polish Academy of Sciences in Warsaw has been organizing the Young Physicists' Tournament since 1990, and since 2000 the Tournament is organized by the Polish Physical Society in close cooperation with the Institute. More information about the Young Physicists' Tournament can be found on the website http://tmf.org.pl.